← 16/38’s EPL Update: You’re Getting Sacked in the Morning! Hey, did you guys know that Manchester City is good at playing this game called “Soccer”? OK that last sentence won’t be a candidate for the Subtlety HOF, but the point still stands. Manchester City have been phenomenal at home, producing the kind of football that is worthy of the talent at their disposal. They’ve collected 24 out of a possible 24 points, bringing about the type of destruction that would be equivalent to Russia’s Military might during the 1930’s. 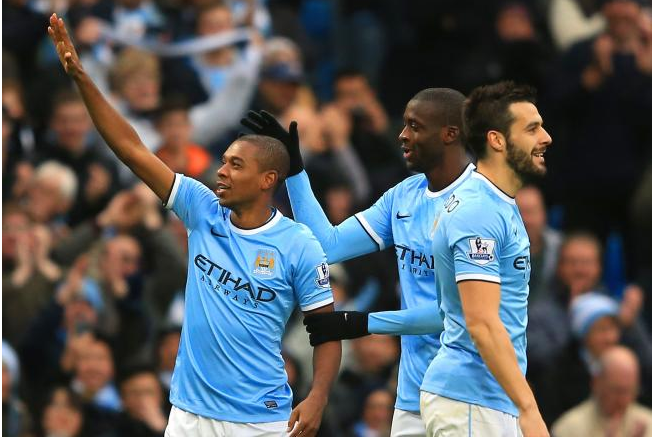 City had a 6-2-0 record over their first 8 home games last yr with a +13 goal differential. Compared that to this season with City producing a +30 goal differential and an average of 4.38 Goals per Game, an outrageous amount that makes you question if life really is fair. As it stands, A 4.38 Goals Per Game pace at home would leave City scoring 82 goals, by far the most of any home side in the history of the EPL and blowing the previous record by Chelsea in the 2009-10 season under Carlo Ancelotti. No one this yr has come close to touching City at home, with their 2-0 victory against Hull the closest an opponent has come. Their 6-3 victory against Arsenal highlighted how lethal they can be under their modified 4-4-2 formation. Their team pressure is second to none, and illustrated in this clip is how they transition into a near Navas goal by the pressure on Nacho Monreal. The fluidity, the artistry, it’s to borrow a cliche, “it’s football of the highest calibre”. City have always played fantastic at home, going 18-1-0 last yr with the best Goal Differential in the EPL, and even going back to the 2010-11 season when they broke their 35 year trophy drought with the FA Cup, they went 13-4-2 with perhaps the best player in the EPL in Carlos Tevez. It’s been a year of resurgence from many on the Man City squad, but two in particular have returned to great form in Man City’s quest for their 2nd EPL title in 3 yrs. Under the Roberto Mancini era, Samir Nasri was in many ways the symbol for the lack of talent realized. The image of a cowering Nasri along the wall for the RVP winner in last yr’s Manchester Derby might very well be the defining image of last season. It’s the type of image one people use to attribute a player’s mental fortitude, and in that instance, it depicted a frightened, spoiled footballer. Compare that to present day, and it couldn’t be more of the polar opposite. Nasri has once again been a force for Man City, displaying the genius and playmaking instincts that best describe his game. He’s created the most chances this yr at 45 with a 2.5 Key Pass Per Game rate. He’s been played out wide along the likes of Fernandinho, Toure, Navas and Silva, combining in link up plays that has resulted in scintillating goals. As Mancini was at times pragmatic with his squad selection, Manuel Pellegrini hasn’t. In having Yaya Toure, Pellegrini is gifted the modern day midfielder. A box to box midfielder of the greatest quality, his abilities are unquestioned, and his partnership with Fernandinho has allowed Toure more of an opportunity to display the attacking instincts he possesses. He has 9 goals on the yr so far, already besting his total of 7 last yr. His free kicks have been surgical, and have been the icing on the cake for dominant City performances. The midfield two of Fernandinho and Toure is perhaps the most physically imposing midfield in the Premier League, and Fernandinho in particular has been one of the most underrated signings of the summer transfer window, particularly when you consider that the likes of Gareth Barry played alongside Toure. It’s been a return to beautiful football for Manchester City, and even with the injury to Sergio Aguero, Negredo with his 7 goals has proven to be a solid buy for the club. Even though City have been rather poor on the road, that will more than likely change. Their TSR (Total Shot Ratio) overall is the best in the EPL this yr at 0.633 and on the road, it’s still at a relatively healthy 0.603. Their SH% overall is 45.1%, best in the EPL. It drops to 30.1% on the road. Those SH% as a whole will will come down but it’s more than likely that while City hasn’t been dominant in the way they are at the Etihad, they’ve been hard done by variance more so than a violent drop-off in quality. Though Arsenal deserves many plaudits for lasting as long as they have in the table; with the form Man City has displayed at home, perhaps just better luck on the road is all City needs to reclaim a second EPL title in three years. This entry was posted in Features and tagged EPL, Manchester City. Bookmark the permalink.